Imagine if you had the power to magically alter reality how you wanted. No longer would things be too high to reach on shelves - you'd just magically pop in a platform and there you'd go! A puddle of mud in front of your car on a rainy morning wouldn't be even a nuisance, since you could just glide across it on your magical floating block! Well, you can't do that in real life, sorry to say, but you can do it in Level Editor. 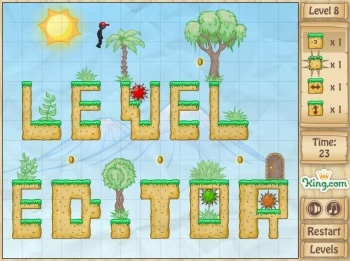 It's a quick little puzzle platformer that has you edit a level in real-time in order to collect all the coins and make it to the exit. Spike traps? Throw a gliding block down. Monstrous spiked balls that will hunt you down and kill you? Crush them! Some of the levels are a breeze, while some will have you scratching your head in confusion. Either way, it's a fun little way to kill time on a lazy Friday afternoon!